Has anyone realised that editor causes empty spaces in html/php/css etc. files? Everytime I open my files - under each line of text appears empty line, so after opening the same file many times I have lots of empty spaces between each line of code... Does anyone have the same problem? How to solve this? What version of WinSCP are you using? What editor do you mean? The internal one? What is your server? What is your configuration of End-of-line characters? I am having the exact same problem, and it just started happening recently. I've been using WINSCP for around 8 months with no problems like this. I use sublime text editor and edit html, css and php files. Please attach a full log file showing the problem (using the latest version of WinSCP). I.e. connection, open the file in editor and save it. I enabled logging, connected and directly opened a certain file with blank lines in it. I went to transfer options, it was binary, I set it to text, and it seems to be ok now. Thanks for the log. Can I get a test account on your server? I have installed Pure-FTPd to confirm that this is an interoperability issue. Martin, you might want to disable this setting by default for external editors in future versions. 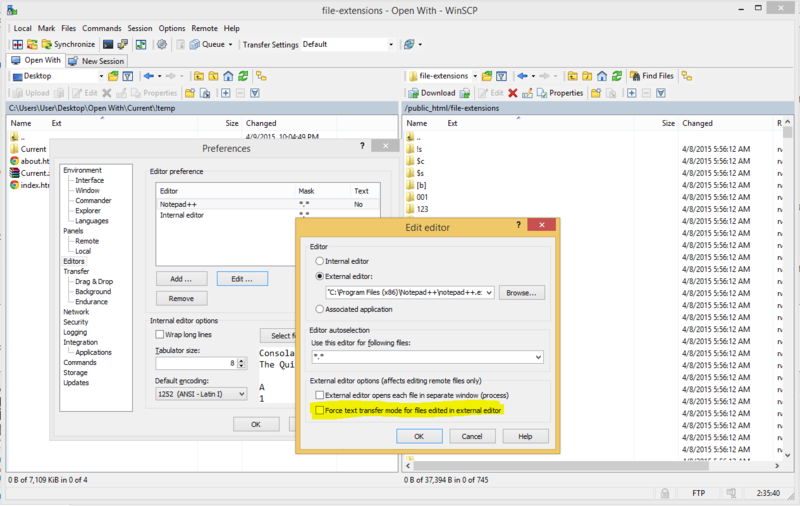 The option is disabled by default for external editors, except for the default Notepad.